Bambola Beauty sent me some of their amazing skin care products. My favorite that I tried was the Mango Moisturizing Mask. It is easy to use and smells great...just like fresh mangoes! Also, it left my skin feeling so soft. All of the products are great though. The products are eco-friendly and chemical free!! The company is run but a mother and her daughter. They are very proud of their line of luxury beauty products (and they should be!!). - Mango Moisturizing Mask .25 fl. oz. - Volcanic Mineral Scrub .5 fl. oz. - Nourishing Apricot Cleansing Creme 2 fl. oz. - Vitamin C Extreme Serum .25 fl. oz. - Pomegranate Soothing Toner 2 fl. oz. The giveaway will be for the Get Acquainted Skincare Kit seen above (An $89 value!!). The giveaway is open until Midnight on Sunday October 3rd. Winner will be chosen on Monday October 4th using Random.org. 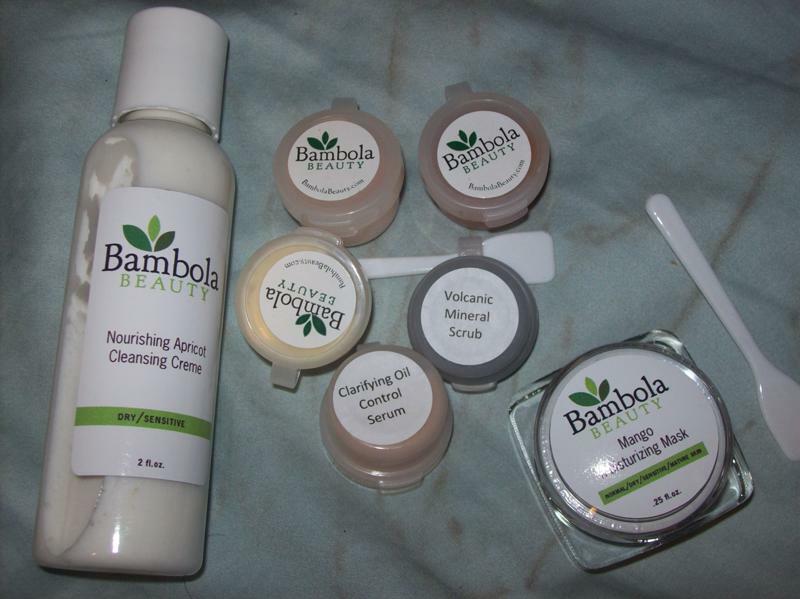 Visit the Bambola Beauty website and let me know which product sounds the best to you! The apricot face cleanser looks the best to me. I entered your BridgeWater Candles giveaway. The mango moisturizing mask sounds great!! Citrus Rejuvenating Mask sounds great! The CoEnzyme Repair Creme sounds like something I need.Please enter me. I just happened to find that pic today on another website & loved it! The Anti Aging Serum sounds the best to me! I love your blog. What a great topic with interesting info. I'm following! The clarifying oil control serum peaks my interest. I have a button on my blog, top left corner. I'm also entered into your snapware container giveaway. I'm also entered into the Bridgewater candle giveaway. I would love to try this:Intensive Eye Creme it might help the "laugh" lines I am gaining as I start to climb nearer 40 LOL. I am in Canada. intensive eye care sounds really great to me! I love the scent of Pomegranate so I would love to try the Pomegranate Soothing Toner. I love masks, so when I saw the Citrus Rejuvenating Mask ....I knew which one was my fave. Hi, the CoEnzyme Repair Creme sounds best to me--anything that can repair cellular damage sounds great! I would like to try the anti aging youth serum. My favorite product is the Glycolic Sugar Can Exfoliant! I would like to try the Eye Creme. annnndddd i blogged about your giveaway. Following through google.Happy to have the kit.Love the vocanic mineral scrub. Glycolic Sugar Cane Exfoliant sounds great to me. I love exfoliants. I subscribe to your site through GFC! The Acai Anti Oxidant Cleanser! i would love to try their essential avocado moisturizer. The mango mask sounds great!